Presented with permission of the Highfield Cemetery Trust. Highfield Cemetery is located in Charlottetown (Winsloe area) on the Lower Malpeque Road. Published by: Highfield Cemetery Trust, Inc.
. . . A Burial ground is one of the most historical references to our past. The Cemetery captures mortuary art, specialized architecture, inscription art, religious beliefs, family relations,landscape patterns, and a demographic history of the people. The inscription art work and the pleasant surroundings can make a respected park of past lives. The cemeteries of Prince Edward Island are fascinating treasures to explore. From one end of the province to the other, a picture is carved in stone. The picture features gentle landscapes, beautiful trees, sometimes a view of the water and, of course, handcrafted monuments offering an immediate link with our past. The memories of those who have gone on before us live in these sanctuaries. knowing the stories of the occupants allows one to appreciate that a cemetery is not a site of finality and death, but a continuation of life. In a way, cemeteries are a vehicle of immortality. The earliest grave markers used on the Island did not aspire to such longevity. They were usually composed of wood - perhaps a cross made of two saplings lashed together with reeds, or an inscribed board inserted in the ground. Others were made of native sandstone, which is easily scribed with a chisel or fling. The elements were hard on these markers. Wood rots, and the soft sandstone melts away in the weather. Thus very few remain, although some examples survive in places like the circular cemetery on Panmure Island and old St. Michael's among the birch trees in Launching. There are many individuals from that era, we say incorrectly, lying in unmarked graves. The graves were originally marked in some manner, and it is the markers that have disappeared, not the grave sites. Considering the drawbacks to native stone, some immigrants brought more suitable stone with them. Some of the early Scots settlers, not sure exactly where they were emigrating to, but certain their move was permanent, brought sized pieces of granite and limestone with them. This stone might even be pre-carved but left blank, to be suitably inscribed on installation. The stone of Thomas Carruthers, in the Kirk cemetery at Cape Traverse, is one of several that were brought over as part of the baggage. Closer to home, quarries in Wallace, Nova Scotia offered a harder, grey-green type of sandstone. Carvers called it "freestone." because it had no grain to contend with, and most Island cemeteries contain markers carved from this material. Still harder stone like granite and marble tended at first to come from British quarries, mainly in Scotland and Ireland. But by the 1900s, quarries in Quebec and Vermont began to edge British stone out of Island cemeteries. Stone, of course, was not the only material available. At the turn of this century cast metal monuments enjoyed a brief popularity. They were made to look like solid white marble, but a rap on the top reveals that they are hollow. Advertised as "white iron or white bronze," they allowed various trim options to be applied to a basic design. 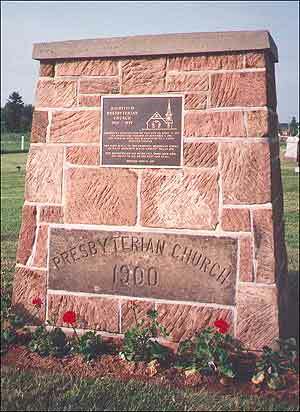 The marker of Reverend Pius MacPhee in Tracadie, or that of Captain Lewis Leard in Freetown are excellent examples of this type of marker. Few early settlements could number experienced stone cutters or gravers among their residents, so early stone markers were often crudely inscribed. As families and settlement became more established, markers of a higher quality began to make their way into Island cemeteries. Stone cutters who specialized in headstones offered more durable markers, and many families chose to "upgrade" their sections of the graveyard. The wealthy might even choose to have their stones cut in Scotland or Ireland. Until the late 1800s, few here made their entire livings from cutting headstones. John Cairns in 1858, for instance, advertised his ability to cut headstones, but also offered customers his line of grist, shelling and other mill stones. The craft was a difficult one to learn in a community that had only soft red sandstone to practice on. Many of the best cutters thus apprenticed in the United States. By the twentieth century, most headstone makers worked from pattern books. Stones cut before this era, however, strongly demonstrate the styles of individual gravers. Very seldom will you see two identical monuments. To reinforce this individuality, the maker usually cut his name into the base of the stone. When looking for gravers' marks, keep in mind that "P.C." stands for "Perpetual Care," not somebody's initials. A grave marker's opulence depended on the budget of the family paying for it and the skill of the carver working on it. A few stones even incorporated freestanding sculpture as part of their design. Augustine and John MacDonald's stone in the St. Andrew's Cemetery features two gargoyles, and was carved by Antoine Vincent, a Quebec-born sculptor who came to Charlottetown to work on the first St. Dunstan's Cathedral in the early 1900s. A stone crafted of similar material stands in Kinkora. It marks the grave of Dr. Michael Wall and displays a bust of the deceased and a finial with the provincial crest. It is also believed to be Vincent's work. A stroll through a cemetery offers much detail about family and Island life. You will notice that most graves are contained in family plots, marked by a single family monument. Such monuments serve entire family units - in one instance as many as sixteen family members! On the surface, these large, often granite stones seem to be a reflection of opulence or ego. Look further, and see them for what they are; an image of family, solidity and permanence expressed for succeeding generations. A walk through an Island cemetery can reveal an entire community history. Notice how the stones placed in the 1930s tend to be smaller, made of soft Georgia granite with the sides left rough. Ornamentation and inscriptions tend to simplicity - a reflections of the economics and ethos of the era. In older cemeteries, note how British and French surnames dominate. Note when the more "unfamiliar" Lebanese, North European and Asian names begin to appear. Along with the Celtic crosses, don't be surprised to see Polish eagles, Orthodox crosses, even the occasional Estonian sun. Compare the ancient stones inscribed in Gaelic with the modern ones featuring Arabic or Mandarin. See how different eras seem to favour different symbols. You don't have to be there just to visit an ancestor. Look a little more closely at certain stones, and ponder some of the community folklore. Is that really Lord Selkirk's daughter in St. John's Presbyterian in Belfast? Look at Elizabeth (MacDonald) McInnis' stone at St. Mary's in Souris. Was it King George III she was supposed to have danced with once. Or was it George IV? For its occupants, a cemetery is a peaceful oasis. For us, it should be a welcome respite from the world, place for both reflection and exploration. While they should be treated with respect and dignity, the grounds are also a park. Reverence is not compromised by a family enjoying a picnic, a couple enjoying a jog, or an individual enjoying a meditation with the past. A cemetery is an active part of our community of today and a tribute to our community of yesterday. Please. Walk on the grass! This article is one of several unfinished pieces found in the personal archive of my uncle, John Russell Leard, who passed away in 1993. I have edited and in some cases added to his text. He lists, as his sources, the various stones and markers he visited in Island cemeteries, and interview he had, probably sometime in the early 1980s, with Johnny Beers of Brooklyn, monument carver and gospel singer, and a conversation with the Reverend John Sutherland Bonnell of New York, NY, on the symbolism of grave markers. My daughter Susan and myself took this material and verified his observations by traveling to the cemeteries he cites. A special thanks to Reg "Dutch" Thompson for his assistance and guidance, and to Canon Robert Tuck for further advice on the symbolism to be found on grave markers. The following list of some symbolic interpretations is helpful when viewing these older memorials. Broken - a person has passed away in the prime of his life. Complete - signifies that life has been completed. Urn on top - a symbol of death. Shroud on urn - a funerary sign meaning burial. Winsloe - Amidst the skirl of bagpipes rendered by piper Bruce MacLaren, a cairn marking the site where Highfield Presbyterian Church once stood was recently dedicated. The cairn was dedicated by Rev. William Scott, assisted by Rev. Donald Nicholson. For many years the church was a focal point for families in the community. Highfield Cemetery, Winsloe (formerly know as St. Anthony' Burial Ground) was consecrated in 1870, when Hugh MacKinnon donated land to be used as a community burial ground. Construction of Highfield Presbyterian Church commenced on April 11, 1900, and it opened for worship on Nov. 4 of that year. Described in detail in the Charlottetown Guardian of Nov. 14, 1900, it was written: "The congregation is to be congratulated upon the construction of such a handsome church. It has not been erected to gratify the lust of the eye, being plain in design, yet it is a very pretty and substantial building." Old church accounts record: "The total cost of church $1,551.15." The unveiling of the cairn was performed by Millar Sanderson and Raymond MacKinnon, who took up the work of previous generations in the upkeep and beautification of this pioneer cemetery. The dedication of the cairn was the fulfilment of a promise made to erect a memorial to the church, after its removal in 1959. In recounting the history of cairns, Rev. William Scott was both enlightening and entertaining. He spoke of the first cairns, constructed loosely of large stones, placed in a common heap by clansmen departing to do battle among themselves or with the English. Before leaving on such a campaign, each fighting man added his stone to the new cairn. Upon his return, he retrieved this particular rock, those remaining bearing testament to the numbers who had fallen in battle. The P.E.I. United Church Men, accompanied by pianist Marguerita Wood and organist Wendell Stevenson, sang a variety of hymns, leading the congregation in the closing selection, a rousing delivery of "Mine Eyes Have Seen the Glory." Rev. Donald Nicholson delivered the benediction in both English and Gaelic. Today, family and community lovingly attend this cemetery. Some stones have failed to survive the passage of time, and hard times prevented many hallowed resting places from ever being marked. Our proud chestnut tree, planted by Lemuel MacLean is a living memorial to Elizabeth and Reagh, his young children, who died only two days apart. In more prosperous times, trees to beautify, have been planted and an iron archway erected. Since 1973, our annual memorial flower service has been held, providing a special occasion for fellowship in today's more mobile community. The dedication of those including Millar Sanderson, the late John MacKinley, Redvers Stewart and Stewart MacKinnon, who held leadership roles in affairs of cemetery, has perpetuated the interest and maintained the property for successive generations. Twenty-one members currently comprise the cemetery committee who gratefully acknowledged the support of the following individuals - Cody Banks, Trevor Matheson, Frank Johnson, Jeff MacKinnon, Al Brideau and all those who contributed in so many ways. William P. Lewis emigrated to Canada from Scotland in 1853. Shortly after arriving, he located at Cardigan River. He built saw and cloth mills on the site now called Lewis' Creek. Mr. Lewis had learned the trade of the stone mason in Scotland and for several years took contracts for building stone walls and plastering. After the Cardigan Bridge was built, he ran a business and operated a general store for a number of years. When that failed, he started a new business - the Lewis Monument Works - which became well known throughout the Island. Many Lewis monuments can be seen in local cemeteries. Marble for these monuments came from Vermont by ship and then later by train. One of the finest examples of Mr. Lewis' work is the main altar at All Saints Church, which he designed and carved. Mr. Lewis' granddaughter, Agnes MacDonald, remembered a beautiful marble table he made for his daughter, Catherine. This table was adorned with rose thistle and shamrock. Two similar tables were donated to Notre Dame Convent in Charlottetown where they can still be seen in the parlor. This special talent was passed on to Mr. Lewis' sons. William A. and David. Stephen Livingstone worked as an apprentice in the shop. Alfred Keoghan and Joe MacLellan worked with the Lewis' as stone cutters. William A. Lewis constructed the communion rail for All Saints' Church. Many older parishioners remember this railing which was removed from the church during renovations around 1955. As well, he designed the monument erected on Brudenell Island in memory of the Scottish pioneers. A small industry that operated for a few years in Wilmot Valley was the Marble Works. It was in Lot 19 across the road from the school and its location can be seen on Lake Map, 1863. The shop was owned by Simon L. Hale whose occupation was marble engraver. His work included mantle pieces, table tops and tombstones. Some of his work can be seen in the Baptist Cemetery, Bedeque and in Lower Bedeque Cemetery. These tombstones tend to be similar in appearance - a slab of white marble with a design at the top, either a carving of hands or an open Bible. It would appear that the parties who bought the tombstones did their own installation as they do not have a base like the stones of today. His work can be distinguished from others because a marble engraver, like a painter, usually marks his work in the lower corner. Unfortunately a coating of moss and the natural erosion of the marble which occurred over the years has made the mark hard to find. A story entitled, "This was Marble Mountain" in a recent issue of Cape Breton's Magazine, tells about the rather exacting work of splitting and removing the slabs of marble from the mountainside and cutting and polishing them in the marble mill. About this time lime was being shipped from this area of Nova Scotia to Prince Edward Island so it is quite likely that each boatload would include a few marble slabs for Mr. Hale. Mr. Hale died when only thirty-five years of age and after his death the marble works of Wilmot Valley closed. Auditorium Over Crowded at the Services. A Brief Description of the Edifice Recently Erected at Highfield. Sing to the Lord with cheerful voice, etc." Rev. Mr. Goodwill preached an able and interesting sermon from 2nd verse of the 66th chapter of Isaiah. In the afternoon not more than one half the people could gain admittance into the church and while many stood by the widows to hear the discourse many turned away when they saw the place so crowded. Rev. D. McLean, the pastor of the congregation preached from Jeremiah 7th chapter, 2nd verse. At the evening service the Rev. Joseph congregation preached from Jeremiah 7th chapter, 2nd verse. At the evening service the Rev. Joseph Parkins preached to a crowded house from the words "Behold he Prayeth" Acts 9:11. He gave a very practical and interesting discourse and had the undivided attention of the large congregation from beginning to end. The congregation is to be congratulated upon the completion of such a handsome church. It has not been erected to gratify the lust of the eye, being plain in design, yet it is a very pretty and substantial building. The congregation, as a whole, seem to be in a flourishing condition, as this is the third new church that has been erected within its bounds during the last four years, also one repaired. The one just completed was only commenced in the early part of the summer, but a willing people with an active, energetic committee can do marvelous things in a short time .Mr. Charles Bovyer, foreman, Mr. Neil Stewart, Mr. D. Carr, Mr. Lawson and Mr. Neil McKinnon, were the carpenters, and all have shown by their workmanship on this building that they are experienced men. The work is neatly done and the acoustic properties good. The arched ceiling is finished in ash and walnut and reflects great credit upon the designer. The tapering spire is surmounted by a large Scotch a fitting emblem for the Church of Scotland. The finishing touches inside and outside were given by the well-known painter Mr. Corney. He is always ready to take a contract in his line of business and always able to do it well. The building is heated with hot air; the furnace being supplied and placed in position by Mr. Hermans. Two rows of pews - the two outside rows being curved - were made by the well-known firm of Mark Wright & Co. The thanks of the Committee and of the entire congregation are hereby tendered to the many friends both in the city and in the country who have so generously contributed towards the erection of this church and a warm welcome will at all times be given to all who may come to worship the God of their fathers in the "Old Kirk.." The receipts on the day of opening amounted to about $100.00. This information was obtained from a personal survey of the cemetery and documents held at the Public Archives of P.E.I. The transcript may include: dates of birth, death and marriage, number of children, surnames, maiden names, place of birth, persons work and military records. Also included is the prose, poetry, and scriptural verses that are on the headstone and any other ways to communicate their legacy. In some cases the prose, poetry, and scriptural verses are not readable. This may be due to the erosion of the tombstone resulting from a number of factors: environment, mosses which cover the stone, damage to the stone, and the durability of the stone. For record keeping, what could be seen was recorded and the rest was left. If someone wants to look up scriptures please seek out the Bible (the King James version of the Bible may be most suited to this cemetery). Listed with these transcripts is a map of the Highfield Cemetery graveyard. If you wish to look up the location of a tombstone, simply look for the surname and the section A, B, or C on the map, plus the number given to the stone. An example is: AFFLECK This translates to surname AFFLECT, section B on the Highfield Cemetery map and stone number 239; i.e. B239. Please keep in mind these transcripts are up to September 1996, if names appear after that time period it is only because they would show up in the graveyard. Records of people dying from 1996 to 1999 are not available at the time of printing. Our regrets to family and friends regarding this matter. If you wish to continue on with this cemetery history, please consider visiting the cemetery at Argyle Shore. This place was settled in the early 1800s from Argyllshire, Scotland. In 1791 the vessel Argyle brought 150 Scottish people to P.E.I. Since this is an older cemetery, it is possible one could locate previous generations of people in your family history. Adelaide MACNIELL born November 2, 1893; died October 10, 1986; wife of Alfred AFFLECK. In Memory Of David Albert BEARS Born At Cape Canso, Nova Scotia April 6, 1830 died February 14, 1907; Also His Wife Isabella MCDONALD born November 9, 1830 died April 10, 1866; Janet ROBERTSON born January 25, 1863 died June 13, 1880; David Albert born March 10, 1861 died August 17, 1881; Children of David A. and Isabella BEARS; Martha MCDONALD died August 1, 1911 age 65; Gone Home; Donald a Missionary of The Presbyterian Church born July 11, 1858 died at Indian Head, NorthWest Territory January 30, 1888. Joan M.. born 1927 died 1998; And daughter Donna L. born 1954 died 1997. Augustus BOISNER born 1824 died 1899; His wife Mary MOORE born 1826 died 1900; Their daughter Maud BOISNER JACKSON born 1871 died 1929; Joseph Stephen BOISNER born 1862 died 1936. Charles Daniel BOISNER born September 7, 1889 died March 18, 1976; His wife Violet May MACGREGOR born December 12, 1891 died August 25, 1979; And Flights Of Angels Sing Thee To Thy Rest. In Memory of Christian BOISNER born 1843 died 1924; His Wife Eliza COOK born 1850 died 1902; Gone But Not Forgotten; Annie Alice BOISNER died November 22, 1954 age 72. David BOISNER died March 6, 1905 age 52; His Wife Caroline STOCKMAN died December 5, 1959 age 95; In My Father's House Are Many Mansions. Allan Scott BRYDON born 1954 died 1974 Beloved Son Of William and Shirley BRYDON. In Memory of Catherine CAMPBELL died March 11, 1922 aged 80; Also her nephew Hector Ewan son of Ewan A. and Sarah MACNEILL died December 10, 1921 aged 15. In loving memory of Donald Campbell died October 25, 1933 aged 90; Thy Rest Is Won; Also his wife Flora ROSS died June 27, 1942 aged 80; Gone But Not Forgotten; In loving memory of Euphemia only daughter of Donald and Flora CAMPBELL died August 24, 1903; We Shall Meet Beyond The Tide Some Sweet Day; Leslie CAMPBELL born 1886 died 1959. Eliza CAMPBELL born 1871 died 1962. Albert E. CARSON Gunner C.F.A. - C.E.F. (Canadian Field Artillery - Canadian Expeditionary Force) died 1 April 1959 Age 63. Albert E. CARSON born 1896 died 1959; His wife Rebecca M. SWALLOW born 1903 died 1967; Their sons John E. CARSON born 1940 died 1974; Edison CARSON born 1932 died 1989 Loves Last Gift, Remembrance. Husband George R. CARSON born 1909 died 1993; Wife M.. Evelyn RODD born 1914 -. AB Ralph CARSON born 1922 died 1992 R.C.N.V.R. Lest We Forget. William George CARSON born 1863 died 1910; His wife Sarah Ellen MACKINNON born 1868 died 1961; Their daughter Elizabeth Mildred CARSON born 1898 died 1908; Sophia ESSERY born 1845 died 1935 wife of Albert MACKINNON and Joseph WISE. Kezia CLOW Wife of James CHANDLER died November 23, 1888 age 41; Their children Richard P. died March 1880 Aged 2 years; And An Infant. Mother; Mary V. born 1940 - . ; Father; Fred C. born 1928 died 1992. John CHARLTON born 1849 died 1917; His wife Annie ROBERTSON born 1852 died 1900; Their son Duncan born 1874 died 1902. Lea A. CHOWEN born 1898 died 1989; Jean L. STEWART born 1905 died 1993; Alton Stewart died 1935; Ian Dewar died 1938; Heather Jean born 1946 died 1947; Sweetly Resting. In memory of Francis A. CHOWEN born 1868 died 1935; Also his wife Mary Ellen CHARLTON born 1870 died 1945; In memory of Gordon J.A. CHOWEN born 1899 died 1967. In memory of Henry CHOWEN born Devonshire, England died December 14, 1898 age 76; In memory of Sarah DIXON his wife died February 10, 1913 age 82. Mary Ann, wife of John CHOWEN died January 29, 1898 age 34; Also an infant son. In loving memory William M. CHOWEN born 1862 died 1947; His wife Rebecca J. SELLER born 1865 died 1952; Their daughter Annie S. CHOWEN born 1905 died 1927; Rest In Peace. William Wesley born March 8, 1903 died June 28, 1988. Ernest Leigh born 1879 died 1958; His Wife Alice MACKINNON born 1883 died 1957. In memory of Frederick J. COLES born November 11, 1869 died February 16, 1932; Also his wife Susanna E. MACRAE born July 10, 1863 died June 15, 1934; At Rest; In memory of Annie R. COLES born 1899 died 1936; In memory of John E. COLES born 1897 died 1978; In memory of Daniel Edgar son of Frederick J. and Susanna E. COLES born November 28, 1887 died August 29, 1910; All Flesh Is As Grass, And All The Glory of Man As The Flower of Grass The Grass Withereth, And The Flower Thereof Falleth Away: But The Word Of The Lord Endureth Forever. In memory of Benjamin CRABBE born November 9, 1871 died September 23, 1943; And his wife Catherine MACKINNON born January 20, 1870 died March 15, 1948; And their beloved son Simon W. born January 1, 1904 died April 28, 1947; Daughter Catherine E. FRASER born September 15, 1911 died September 10, 1991. Erected to the memory of Mrs. Margaret CURRAN who died November 2, 1905 aged 93 years; At Rest. In memory of the beloved children of Aaron and Mary DIAMOND; John R. died June 15, 1880 aged 8 years; Margaret L. died June 28, 1880 aged 3 years; The Lord Gave And The Lord Hath Taken Away Blessed Be The Name of The Lord. Sacred to the memory of James DIXON who departed this life July 14, 1906 age 82; His wife Flora MCDONALD died May 15, 1922 age 89; William Wallace STEAD died September 17, 1921 age 48; For Know That My Redeemer Liveth; In memory of Sarah ROPER Relict of the late John DIXON died March 20, 1882 age 90; Henry E. ROPER died December 6, 1901 age 90; Emily DIXON wife of W. Wallace STEAD born 1873 died 1926. Paul DOUCETTE born August 7, 1897 died July 29, 1968; His wife Mary MATHESON born November 19, 1911 died January 30, 1991. Husband Frank M. born 1913 - . Psalm 91; Wife E. Muriel 1920 - . Psalm 23. William C. ENMAN born November 4, 1867 died January 7, 1942; His wife Margaret J. MACNEILL born February 6, 1872 died May 24, 1964; Not My Will, But Thine Be Done. Stephen EUDEY born February 2, 1888 died July 20, 1960; His wife Hazel CHOWEN born March 11, 1894 died November 29, 1983; Your Love Will Light My Way, Your Memory Will Ever Be With Me. George E. FORD born April 1, 1900 died September 5, 1965; Married January 5, 1929 Nellie S. CARSON born January 13, 1895 died January 11, 1989. Vincent A. FRASER Sergeant D & H Rifles of CDA died 18 March 1990 age 79. John S. Gamble born November 26, 1917 - . ; His Wife A. Florence GORDON born January 6, 1925 - . Mary A. BROOKS wife Of Samuel GILLESPIE died November 28, 1911 aged 69; In memory of Samuel GILLESPIE born 1844 died 1931; Also his wife Barbara E. MOLYNEUX born 1867 died 1929; At Rest; Resting In Hope Of A Glorious Resurrection; At rest, Clara May PROCTOR wife of Spurgeon GILLESPIE died June 13, 1950 aged 68; Reagh Coles GILLESPIE born August 20, 1915 died May 26, 1982; Forever With The Lord; His beloved wife Hilda Leah LARTER born March 21, 1917 died May 24, 1998; Always Remembered Always Loved. In memory of William M. GILLESPIE died March 11, 1915 aged 72; Also his wife Flora Ann CAMPBELL died March 12, 1936 aged 76; Asleep In Jesus Blessed Sleep From Which None Ever Wakes To Weep. Oliver R. GOOD born 1882 died 1969; His wife Sadie M. CHOWAN born 1888 died 1952. Infant daughter of Dr. V.L. and F.M. GOODWILL died February 19, 1907. 50 years a minister of The Church Of Scotland in peace; Rev. John GOODWILL born in Antigonish, Nova Scotia December 11, 1831 died January 22, 1905; Fideli Gerta Merces; Euphemia Jane COOPER wife of Rev. John GOODWILL born in Pugwash, Nova Scotia September 11, 1848 died February 20, 1930; At Rest - His son George E.A. died December 28, 1904 age 19 years; At Rest - His son Rev. Thomas William. born January 6, 1872 died October 12, 1948; In Loving Remembrance of C. Elizabeth only daughter of Rev. John GOODWILL and Euphemia J. COOPER born In Anyteum, New Hebrides November 28, 1870 died at Brighton December 29, 1899; Them Also Which Sleep In Jesus Will God Bring With Him. Anne WALKER LYDFORD born January 28, 1882 died June 18, 1974 Beloved mother of Elva, Rita And Robert; Till The Morning Sun Rises. Reta A. LOUGHRAN born 1908 died 1977; Mother of James A. HERON born 1932 died 1985; Joyce MACDOUGALL born 1931 - . ; Love Lives On. John Benjamin (Benji) beloved son of Kip and Anna born February 20, 1985 died November 14, 1990; But He Knoweth The Way That I Take: When He Hath Tried Me I Shall Come Forth As Gold. Job 23:10; You Are The Wind Beneath My Wings. In loving memory of Charlotte Jane daughter of George and Mary E. HOWARD born 1876 died 1896; For To Me To Live Is Christ And To Die Is Cain; George HOWARD born 1847 died 1937; Love The Lord Because He Hath Heard My Voice; In loving memory of Mary E. SELLER wife of George HOWARD born 1851 died 1941; At Rest. Augustus Charles HURRY born March 20, 1882 died January 11, 1930; His wife Minetta STOCKMAN born May 10, 1878 died March 13, 1963; In His Will Is Our Peace. Cecil Duane born January 3, 1972 died March 9, 1972 Beloved son of Cecil and Dale HURRY; Budded On Earth To Bloom In Heaven. In loving memory of Daniel HURRY born 1860 died 1924; His wife Elizabeth FERGUSON born 1855 died 1918; Robert James MURRAY born October 14, 1898 died December 28, 1964; His beloved wife Enid Marion OWEN born October 1, 1907 died February 16, 1979; Son, Douglas Owen HURRY born February 11, 1937 died August 28, 1937. James W. born 1883 died 1970; Helena born 1883 died 1946; Always Remembered. John Allen born December 25 died December 29, 1941; Barbara Jean born June 6 died October 26, 1951; Infant children of Stanley and Marion HURRY. Jeremiah JAMES died January 6, 1903 aged 88; Also grandson and great grandson also Fred JAMES wife and son. Erected by John JAMES. In memory of A. Hammond LARTER died April 17, 1920 aged 52; His wife Emaline MOLYNEAUX died May 6, 1919 aged 42. In memory of John LARTER died April 13, 1923 aged 92; In Thee O Lord Have I Put My Trust; Their son Charles Alfred died January 19, 1880 aged 24; Mary TREDENICK wife of John LARTER died March 10, 1913 aged 91. In memory of John Eldon LARTER born October 6, 1898, died July 25, 1933 Erected by his wife and family. Donald MACDONALD born 1794 died 1879; His wife Jessie MACKINNON born 1798 died 1883; Anthony MACDONALD born 1782 died 1874; Born In Mull, Scotland. In memory of Janet ROBERTSON relict of the late Donald MACDONALD York River died June 17, 1879 age 78 years; She was a native of Perthshire, Scotland and emigrated to this Island in 1821; Ye , Walk In Death's Name Ill: _____ And Thy Rod and Staff Are Comfort Still. John G. MACFADYEN born 1877 died 1952; His wife Maud WALKER CUNNINGHAM born 1885 died 1972. In memory of John Allison MACGREGOR born July 11, 1925 died May 12, 1978; Beloved husband of Eleanor Ross BOURKE born November 7, 1930 died July 30, 1981. William W. born October 22, 1929 died March 24, 1995; His wife Irene M. GIDDINGS born August 30, 1935 died June 27, 1995; He Walked His Own Path She Was The Wind Beneath Our Wings; S'Riogghal-mo Dhream. James A. MACINTYRE born 1857 died 1901; His wife Jane MACLEAN born 1846 died 1951; Their daughter Elizabeth born 1874 died 1893; Their son James R. born 1892 died 1894. In memory of John MACKINLEY died March 4, 1900 age 77; Our Father In His Wisdom Called The ______ His Love And Had Given And Thought On _____ The Body Lies ___The Soul Is Safe In Heaven; His wife Catherine MACKINNON died May 28, 1928 age 95; In memory of William Ernest MACKINLEY died January 15, 1942 age 70; Mary Irene DIXON died July 21, 1957 age 70; Their son Daniel died August 22, 1876 age 20. W. Leroy Dixon MACKINLEY born 1924 died 1996; Joan D. STEEVES born 1937 - . Albert T. MACKINNON born 1891 died 1945. Arthur G. MACKINNON born July 12, 1899 died June 26, 1980; His wife Eva LINK born April 18, 1906 died September 6, 1943; Their daughter Shirley Marie born October 27, 1934 died December 21, 1935. David L. MACKINNON born 1887 died 1959; His wife Lulu Ellen HURRY born 1890 died 1970; Grandson David Berron MACLEAN born May 3, 1933 died July 30, 1970; Son John Calvin MACKINNON born December 30, 1920 died August 22, 1996. Father, Donald MACKINNON born November 3, 1816 died November 10, 1890; Mother, Elizabeth JARDINE wife of Donald MACKINNON born October 13, 1820 died February 25, 1903; Child Malcolm MACKINNON born 1852 died 1924; His wife Ellen SMITH born 1854 died 1937. Gordon Daniel MACKINNON Born June 26, 1914 Died August 22, 1994; His Wife Sarah Louise MACDONALD born July 22, 1930 - . In Loving Memory. GNR (Gunner) John C. MACKINNON born 1920 died 1996 R.C.A.C.A. ; Lest We Forget. SGLMN (Signalman) John M. MACKINNON born 1919 died 1992 R.C.C.S. C.A. ; Lest We Forget. Husband, Lea H. MACKINNON born 1908; Wife S. Evelyn CORNEY born 1914 died 1992; Married February 10, 1932; Harold D. born 1937; His wife Linda C. born 1940; Freda L. born 1933; Her husband Eric W. born 1931 -. Lea H. born 1908; S. Evelyn CORNEY born 1914 died 1992; Together Forever; Married February 10, 1932. In Memory of Maria C. MACKINNON born 1864 died 1936 daughter of Archibald and Margaret C. MACKINNON formerly of North River; In memory of Hugh MACKINNON born May 2, 1867 died October 7, 1944; His wife Mary Broach MACINTYRE born December 14, 1881 died November 3, 1981. In loving memory of Roderick R. MACKINNON born 1866 died 1926; His wife Elizabeth Ann MACKINNON born 1862 died 1944. Russel A. born 1888 died 1941; His wife Mabel R. born 1888 died 1960; James Albert born 1930 died 1931; Great Love Lives On. Stewart MACKINNON born 1893 died 1980; His wife Jean COLES born 1895 died 1924; Also his wife Winnifred CONNOLLY HOOPER born 1893 died 1988; Daughter Margaret Edith born 1918 died 1950. William P. born 1899 died 1988; His wife Edna HURRY born 1885 died 1951; Rest In Peace. Alexander MACLEAN born 1871 died 1925; His wife Mary Jane COLES born 1890 died 1982; Our daughter Helen A. aged 24 days. Chester MACLEAN born February 20, 1903 died December 23, 1976; His wife Marion F. STEWART born May 25, 1907 died June 23, 1996. Alan James MACLEAN born March 17, 1945 died December 16, 1974; In memory of James Louis MACLEAN born February 23, 1906 died August 2, 1991. Lemuel Y. MACLEAN born 1863 died 1941; His wife Margaret C. CARSON born 1872 died 1954; Their son Reagh born 1894 died 1900; Their daughter Elizabeth born 1899 died 1900; Margaret Alexandra born September 25, 1911 died November 18, 1998. MACPhee (MAC) born 1919 died 1983; His wife Annie R. GASS born 1921; Son Jack born 1944; Amazing Grace. Jane A. PROUD Beloved Wife Of William MACNEILL Fell Asleep January 29, 1927 aged 80; Also their son George H. born March 21, 1879 died April 16, 1932; William MACNEILL born August 28, 1848 died January 17, 1933; In Memory of Frederick J. Son of William and Jane MACNEILL born March 11, 1884 died May 1, 1913; Yea Though I Walk In Deaths Dark Vale Yet Will I Fear None. John MACNEILL born 1800 died 1884; His Wife Eliza A. POLLARD born 1822 died 1907; Joseph VICKERSON born 1844 died 1925. PTE. (Private) John MACNEILL born 1913 died 1972 P.E.I. Highlanders; Lest We Forget. Lemuel Hammond MACNEILL born August 27, 1877 died July 26, 1962; His wife Elizabeth Frances PROUD born November 26, 1833 died January 27, 1967; Their son William Henry MACNEILL born February 28, 1908 died November 23, 1964; John Lemuel MACNEILL born 1913 died 1972; Till We Shall Meet And Never Part. In loving memory Marion born 1925 died 1979; Claude born 1922 -. Thelma I. born 1936 -. ; Wife of Roy A. born 1942 -. Torquil MACNEILL died February 15, 1881 age 84; Emigrated from the Isle of Mull, Scotland 1806; His wife Jane YOUNKER died November 20, 1874 age 68. In memory of Duncan MACPHEE died October 20, 1887 aged 70; Also his wife Flora MACKINNON died January 27, 1898 aged 83. In memory of Sarah E. MACPHEE died September 13, 1931 aged 83; Daniel MACPHEE died September 1, 1933 aged 88. James Eric MATHESON born January 23, 1944 died May 23, 1998; Donna Jean YEO born August 28, 1942; Ever Remembered - Ever Loved - Sadly Missed. In loving memory of Neil MATHESON died February 24, 1915 aged 77 years 10 months; His wife Mary Ann MCLEAN died October 10, 1926 aged 80 years; Asleep In Jesus Blessed Sleep; In Memory of Catherine MCNEILL Born In Mull, Scotland May 6, 1806 Died at North River, P.E.I. February 20, 1894; Come Unto Me, All Ye That Labour And Are Heavy Laden, And I Will Give You Rest; In Loving Memory of Archie Son of Neil and Mary Ann MATHESON born July 1, 1875 died October 3, 1904; Let Not Your Heart Be Troubled Ye Believe In God, Believe Also In Me. Herbert S. MATTHEWS born 1914; His wife Myrtle L. MORRELL born 1921; Rest In Peace. Pearl C. born 1912 died 1987. Thomas M. MCCULLOCH born 1911 died 1992; His wife Nellie A. DEKKER born 1914; The Lord Is My Shepard. In memory of Donald MCCFADYEN died August 1, 1992 age 72. In memory of James B. MCINTYRE born 1830 died 1924; His wife Christy Ann MCLEAN born 1846 died 1930; In memory of J. Percy MCINTYRE born 1875 died 1936; In memory of Kenneth M. MACINTYRE Born 1932 Died 1975. In memory of John A. MCKINLEY died February 27, 1911 aged 46; Asleep In Jesus Peaceful Rest. In memory of John MCKINNON died December 5, 1885 age 92; A native of Isle of Mull Argyleshire Scotland emigrated to this Island in 1810; At Rest In Jesus' Faithful At Rest As In A Peaceful Bed! ___From All The Dreadful Storms ___Wind This Sinful World Are ____. In Memory of Malcom MCKINNON; His sister Margaret died November 6, 1898 age 80; Blessed Are The Dead Who Die In The Lord. In memory of Murdoch MCKINNON died December 14, 1885 age 82; A native of The Isle of Mull, Argyleshire Scotland; imigrated to this Island in 1834; My Dearest Friends That Dwell Above I Now Have Gone To See And All My Friends In Christ Below Will Soon Come After Me. In memory of Archibald MCLEAN died July 16, 18?0 age 69; Faithful And I Will ?ive ? Erected by his Nephews of Popular Island Farms. In memory of Daniel died May 6, 1891 age 28 beloved son of James and Mary MCLEAN. In loving memory of Ellen MCLEAN born 1837 died 1929. In memory of Flora relict of the late Hector MCLEAN died November 20, 1876 age 54; Till God Did And Free Her of Her Pain. In memory of Hector A. MCLEAN died February 6, 1890 age 35; Blind Unbelief Is Sure To And _______ God Is His Own In ______ And He Will Make It Plain; Ann MCLEAN born 1843 died 1930; Blessed Are The Dead Which Die In The Lord; In memory of Ewen C. MCLEAN died November 16, 1890 age 30; Another Link Is Broken In Our Household Band But A Chain Is Forming In A Better Land; In memory of Cowen D.R. MCLEAN drowned August 25, 1882 age 25; Come Before ______ To. In memory of James MCLEAN died May 31, 1907 aged 89; His wife Mary MCKINNON died January 28, 1916 aged 86; Also their son Allan died January 4, 1941 aged 84; No Pains, No Griefs, No Anxious Fear Can Reach Our Loved One Sleeping Here; Their daughter Elizabeth born June 9, 1859 died February 7, 1946. Dawn Sharleen born February 22, 1968 died August 26, 1970; Beloved daughter of Donald and Colleen MCLEOD; There Hath Passed Away A Glory From The Earth. Gordon N. born 1925; His wife D. Jean born 1925; Absent From The Body Present With The Lord, Jesus Christ. PTE (Private) Leonard E. MCNEILL born 1907 died 1990 P.E.I. Highlanders C.A. (Canadian Army); Lest We Forget. In loving memory of Neil MCNEILL born September 4, 1856 died February 11, 1921; His wife Margaret Isabel born February 15, 1866 died April 23, 1923; Tho Lost To Sight To Memory Dear. Their daughter Isobel Carlyle born June 8, 1936 died November 1, 1998. Grave marker. William MIDDLETON died November 23, 1904 age 80; His wife Ann DIXON died April 27, 1904 age 78; Their children Mary L. died April 4, 1889 age 5 years 6 months; Lemuel R. died March 7, 1899 age 13; In memory of Daniel MIDDLETON died November 20, 1909 age 58; His wife Miria SELLER died March 13, 1899 age 45; Heber D. MIDDLETON born September 23, 1888 died June 6, 1963; Yea Though I Walk Through The Valley Of The Shadow Of Death, I Will Fear No Evil. Psalms 23:4. Blanche MACINTYRE born 1888 died 1963 wife of William MOORE. Enoch MUGFORD born 1846 died 1880. Ida M. NELSON born 1881 died 1969. Owen Henry PROUDE born July 3, 1892 died May 20, 1962; His wife Florence E. WALKER born July 13, 1893 died May 14, 1971. (Mother) Ann HENDERSON wife of Elijah PURDY Born In Tatamagouche Nova Scotia December 27, 1805 died July 25, 1886. (Father) Elijah PURDY A native of Malagash Nova Scotia died May 4, 1895 aged 96. Don RHODENHIZER Staff Sergeant Royal CDN (Canadian) Dragoons died 3 April 1987 age 62. Don Rexton born January 18, 1925 died April 3, 1987; His wife Hazel June RATH born May 31, 1925 died November 25, 1998; Life Is Changed, Not Ended. In memory of Eliza CHANDLER Beloved wife of Donald ROBERTS died June 14, 1922 aged 82; Donald C. ROBERTS died October 24, 1924 aged 77. Bessie J. died October 26, 1888 age 4 years and 7 months daughter of John D. and Ellen RODD Budded On Earth To Bloom In Heaven. In memory of John D. RODD died January 9, 1895 age 42; Be Thou Faithful Unto Death And I Will Give Thee A Crown Of Life; Also his wife Eleanor PIERCE died December 14, 1939 aged 82 years. Thomas R. ROGERSON Bombardier RCA (Royal Canadian Airforce) died 19 November 1986 Age 66. (Father) G. Miller SANDERSON born 1902; (Mother) Edna P. PROUDE born 1910; Infant daughter Grace born September 1943 died November 26, 1943. Melvina M. born 1869 died 1941; William born 1868 died 1957; His wife Annie BENNETT born 1863 died 1957; At Rest. Mary, the wife of John STEWART died March 24, 1875, age 86. A native of Mull, Scotland. J. Huestis WATTS died April 6, 1959 aged 85; His wife Elizabeth R. HOGG died November 24, 1959 aged 83; James Emerson WATTS died March 29, 1912 aged 14 months; W. Preston WATTS died May 10, 1926 aged 19 years; Eleanor Jane JAMES wife of James WATTS born 1830 died 1911; James WATTS died September 19, 1918 aged 78; Edith Elizabeth WATTS CHAPPELL STEWART born July 27, 1905 died November 12, 1981 Beloved mother and grandmother. Bessie Eileen MURPHY born October 1, 1919 died September 17, 1995 Loving mother of Roger and Melvene; Step Softly, A Dream Lies Buried Here. Wilfred B. WOOD born 1894 died 1954; Children Doris S. and William W.
When using the index please keep in mind that wives are indexed under their married and maiden names and under their combination of married names in cases where they married several times. In cases where we were uncertain if it was the person's second or their surname we listed it as a surname and related it to the proper cemetery tombstone surname it was listed with. This index lists people in the cemetery who may not have a tombstone, gravemarker, but came from other sources in the cemetery, church, or public archive transcripts. For names which begin with Mc or Mac please look under both spellings.